Those pop-ups in the bottom corner of a website can be annoying. But when you have a question or need help, suddenly you realize just how useful they are. Although chatbots have become extremely popular on for-profit business sites, especially with millennial customers, nonprofit organizations have yet to adopt the technology. There are good reasons to put chatbots to work on your website. First, it can help to understand exactly how they work, though, and how you can put it to use in interacting with your own website visitors. A chatbot is software that resides on a website and uses artificial intelligence to interact with visitors. You’ll see it in the form of a, “How may I help you?” textbox that appears when you first pull up a page. The customer can then ask a question, which the “bot” answers in a conversational, human-simulated manner. However, a chatbot’s functionalities are limited since it can only provide information that exists within its databases. Chatbots can improve your existing website by giving your customers a way to get quick answers to the most basic questions. Although it does have its limitations, it can still be invaluable for giving your nonprofit a presence with the people interested in the work you’re doing. 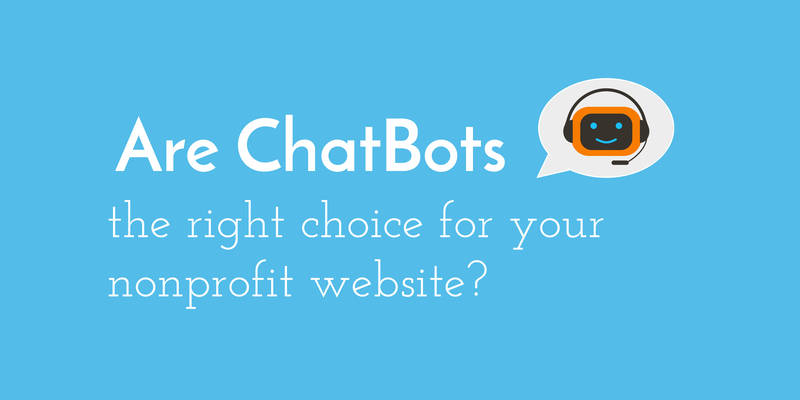 Here are a few ways a chatbot can benefit your nonprofit. Capture more supporters. Instead of searching your site for information, visitors can input a question and get a quick answer, making it more likely they’ll move to the next step. Hopefully, this next step will be writing a check or deciding to come to your upcoming fundraiser. Gather information on your visitors. If you choose the right chatbot, you’ll have access to every chat transcript. Analytics can also tell you what keywords are most often mentioned in initial chat requests. This will help you update your content so that customers can get the information up front, rather than having to ask a chatbot. Customer support 24/7—No need to ask volunteers or team members to monitor a support line around the clock. Your chatbot is always on. Save time and money—According to IBM, chatbots can answer up to 80 percent of routine customer questions. This means instead of answering the phone or responding to emails, your team can redirect their efforts to more important duties. You no longer have to hire a developer to create a custom bot for your site. There are many affordable cloud-based options that can work with your existing website with minimal setup. Some of those apps even provide a hybrid solution that lets your own team take over and chat with visitors when your chatbot has gone as far as it can. Research the various options and find one that works best for your own environment. Chatbots are growing in popularity with businesses, but they can work just as well for nonprofits. It’s important to shop around to find the chatbot that has the features you need. With so many options, you should be able to set things up even if you don’t have advanced tech knowledge. We hope this makes you a little more comfortable about implementing chatbots on your website. If you need any help along the way, please contact our marketing team.